SV Deals, Ultra Portable Kit Deals, Devices, Ultra Portable Systems, New Arrivals! SELECT VAPE EXCLUSIVE COMBO DEAL! Get the Lost Vape Orion Q Device Kit (color of your choice) + 2 Pack of Orion Q 1.0ohm Refillable Pods + a 30ml bottle of Select Vape Nic Salt of your choice and save! Select Vape presents the “Orion Q 17W AIO Device Kit” by (Lost Vape). The Orion Q is a cheaper alternative to the successful Orion DNA Go Device featuring a proprietary chipset, 950mAh integrated battery, a maximum output range at 17W and introducing the 1.0 Orion Pod while following the luxurious chassis and pod system. This device keeps all the intricate details that the DNA Go has with a beautiful carbon fiber or resin design and a premium alloy shell for a high end AIO pod system. The Orion Q is equipped with an intuitive LED battery light that displays the current battery state of the device (Blue – 100-64%, Purple, 64-17%, and Red 17-0%). This devices utilizes a single button interface and cannot customize or adjust the set wattage of the device. Select Vape presents the “Orion Q 1.0ohm Refillable Pods” by (Lost Vape). The Lost Vape Orion Q 1.0 ohm Replacement Pod exclusively fits in the Orion Q. These cartridges are beautifully designed 3ml refillable pods built with an AFC drip tip and 1.0ohm SS316L coil specifically focused on vapor enhancement. 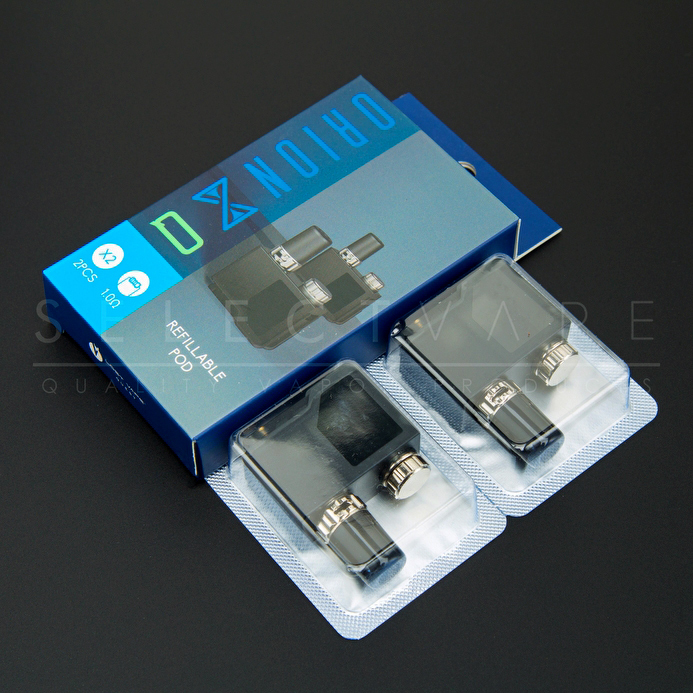 Each pack comes with 2 replacement pods for your Orion device. Don’t wait and supply your device with these replacement pods! Select Vape presents “Puckerita” Nic Salt. “Puckerita” delivers a sweet, sugar coated apple sour belts flavor infused with cool and refreshing menthol. Each vape hit will make your mouth “pucker” with its sour apple flavor while soothing your palette with icy cold menthol. Combined with Nic Salt, “Puckerita” is the perfect Nic Salt E-liquid if you’re looking for an amazing menthol infused candy flavor. Select Vape presents ”Gummie Lyfe” Nic Salt. Select Vape’s famous E-Juice flavor, “Gummie Lyfe,” has now been implemented into Nic Salt form, providing a delicious flavor of sour berry gummy candie for your everyday vaping experience. This Nic Salt is the ultimate sweet and sour blend. “Gummie Lyfe” offers a explosion of sweet and sour flavors that compliment perfectly, while creating the ultimate delicious all-day vape. “Gummie Lyfe” is the perfect amount of sour but still sweet and fruity! Select Vape presents “Stryker” Nic Salt. “Stryker” features the smooth and robust sensation of a creamy vanilla cigar. “Stryker” delivers a smooth and solid throat hit while maintaining the delicious creamy vanilla cigar flavors. This Nic Salt is perfect for tobacco flavor loving vapor enthusiasts everywhere. “Stryker” is the one for you if you’re looking for a brand new twist on tobacco flavored Nic Salt! Select Vape presents “Killa Nilla” Nic Salt. Introducing the new “Killa Nilla”, this Nic Salt features a delicious, delicate sensation of rich and creamy vanilla custard. Each hit provides a mouth watering vanilla custard that is sure to keep you wanting for more! Designed with 50VG/50PG, “Killa Nilla” promotes a balance between a solid throat hit, flavor enhancement, and vapor production. Don’t wait and try out “Killa Nilla” today and you won’t regret it! Select Vape Premium E-Liquid is manufactured by “Ruthless Vapors” in Ontario, CA. All of our e-juices are produced in-house in a GMP Certified Facility and State of the Art Clean Room. Our flavors are all made with the highest standard of ingredients and are high in VG content. We ensure all our flavors have MSDS Reports and that they are all tested for contaminants.